I'm waiting for when we will have the next big star ! Cristante is the captain of last season Milan's Giovanissimi Nazionali squad that won the scudetto. Yeah he is an Italian u-16 International, he is being listed in the Allievi Nazionali at the moment (u-17 side).. meaning he jumped a class from our youth set up as he is one of the two youngest players in the Allievi. Milan supposedly have some interesting and talented youngsters in the youth team (in all levels), if they can live up to their potential some could become star players for us..
Last edited by Dwa Milan; 01-01-2011 at 19:00. Needs no introduction to Bundesliga fans as his breakout season has gone perfectly to plan. A regular for Juergen Klopp’s side and a recent German international. Awesome potential which is already being delivered upon. Wise beyond his years, Jali plays with the experience of a veteran, while his youthful speed and deceptive strength allow him to dominate the middle of the park for Pirates and South Africa. Considered the future Pirates captain. A product of the Stuttgart system, Merkel has yet to decide with whom his international allegiances lie. Impressed for Milan during pre-season when his endeavour and accuracy in the pass failed to go unnoticed. Cites Aleksandr Hleb as an idol. The talented Zimbabwean striker is making waves in South Africa with Kaizer Chiefs, scoring frequently. His masterful finishing and the ease with which he turns defenders has caught the eye of many scouts; it seems to be only a matter of time before the 'Smiling Assassin' graces the pitches of Europe. The defender has already been on trial at Arsenal and Barcelona, having displayed his ability at club level for Sundowns, while slowly breaking into the Bafana squad. His pace and ability to read the game at the back with confidence provide him with the skills to successfully transition to a European club. Last edited by Sonny.Bill.Williams; 01-01-2011 at 21:33. Couple other players worth a look from Goal.com top 100 youngsters. Alex Sandro. Plays LB, Hopefully he is as good as defending as attacking 19 years old. Oscar. Don't know much about him but he plays midfield and looks pretty good. The guy is Marco Verrati from Pescara.I dont know much except for the fact hes an AMC and technically good.Anyone who knows more about this guy? The boy is the "next best thing" in German youth football. I've seen him playing quite a lot and he's by far the best German player in the age group 1995. And yes, I know he hasn't played for the national team yet. One more reason to really hope for a replacement of Frank Engel as soon as possible. Mesut Oezil, Toni Kroos, Mario Goetze, Sonny Kittel and now this Serge Gnabry??? We have some very good talents at the AM position. Last edited by Sonny.Bill.Williams; 05-01-2011 at 11:43. Over recent months, a new generation of young players have been steadily building reputations as superstars-in-the-making. Many, such as Neymar, Javier Pastore, Eden Hazard and Jack Wilshere, have already earned fame and renown, but there are others for whom 2011 could be their big year. Here, FIFA.com looks at some of the likely candidates. Often compared to Thierry Henry due his graceful, athletic style of play, Castaignos last week committed his future to Inter Milan after emerging as one the world’s most sought-after young strikers. Tall, skilful and speedy, the teenager set a new goalscoring record for the Netherlands’ U-17 side and is Feyenoord’s leading marksman this season. Already firmly established as his club’s No1, De Gea has earned a reputation as arguably the most promising young keeper in world football. Manchester United and Arsenal have both been linked with €17m moves for a youngster likened to Iker Casillas by none other than the Spain captain himself. Guus Hiddink made Dzagoev Russia’s youngest-ever outfield player in 2008, lauding him as “a really clever player with the ability to make a killer pass and stretch the play”. Plenty of major clubs across Europe agree, and CSKA Moscow face a battle to hold on to their prize asset. Identified as one of Africa’s top emerging stars, the Moroccan striker has been almost single-handedly leading Caen’s battle against relegation this season. Challenging for the Ligue 1 top scorer award in spite of his club’s woes, El-Arabi has been one of the sensations of the 2010/11 campaign and will be well worth watching in the CAF Africa Cup of Nations qualifiers. Japan have a tradition of producing fine midfielders, and the evidence of the past few months suggests that Kagawa may prove to be their best yet. Since being plucked from Japan’s second tier in August for the modest sum of €350,000, this quick, skilful and tenacious youngster has emerged as one of the Bundesliga’s top performers and is a key player for the Blue Samurai at the AFC Asian Cup. Composed, athletic and powerful, Henderson has been hailed as “the best young British footballer there is” by his Sunderland manager, Steve Bruce. Fabio Capello also recognised the midfielder’s talent by handing him a first senior England cap in November, while Sir Alex Ferguson has expressed a public interest in prising Henderson from his hometown team. Bayern Munich are already rueing the day they allowed Hummels to move to Dortmund. The centre-half has flourished since swapping the Allianz Arena for the Westfalen, with his intelligence, composure, power and man-marking ability suggesting he is a future stalwart for club and country. Already emerging as one of the stars of the Asian Cup, Koo seems set to form a long-term partnership with another impressive emerging Korean midfielder, Ki Sung-Yueng. Praised for his skill and versatility by coach Cho Kwang-Rae this week, this talented playmaker looks set for a major breakthrough in 2011. Courted by Barcelona and tipped for greatness at the age of just 12, this exciting young playmaker has stayed put in Buenos Aires and is now justifying all that early hype. Blessed with vision, touch and superb passing ability, Lamela has been widely tipped as La Albiceleste’s next sensation. Creative genius, flair and dribbling ability have established this attacking midfielder at the forefront of emerging Brazilian talent. Set to thrill at the forthcoming South American U-20 Championship, Lucas is already excelling for Sao Paulo and considered a likely star of this year’s FIFA U-20 World Cup. Lukaku is a true phenomenon. At just 16, already standing 6ft 4ins tall and weighing in at over 14 stone, he became the Belgian top flight's youngest-ever goalscorer. Hailed as ‘the new Didier Drogba’, this pacey and powerful predator is one of the game’s most coveted young stars. Considered the next in a long line of great Italian defenders, Ranocchia finalised a €12.5m move to the San Siro on 27 December after excelling for Bari, Genoa and Italy’s U-21 side. Having debuted on Sunday, the assured centre-half is set to play a major role in the defence of the European champions’ domestic and continental titles. A surprise inclusion in Ottmar Hitzfeld’s FIFA World Cup™ squad, Shaqiri has taken to the international scene like a duck to water. The bigger the stage, the better this skilful and creative Basel midfielder seems to play, memorably scoring his first international goal against England from fully 30 yards before opening his UEFA Champions account in Rome's Olympic Stadium. My friend... This guy is Lucas not Lucas Piazon, both play for San Paolo! 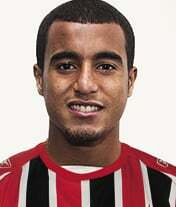 Lucas (Rodrigues Moura da Silva) - 18 years old, attacking midfielder, Sao Paulo. Lucas (Domingues Piazon) - 16 years old, striker, Sao Paulo. Last edited by jouljoul; 16-01-2011 at 15:00. Hahahaha, that did confuse me lol. ahahhaha..btw whatever happened to bochetti? cuz i know people wanted us to land him since jube got bonucci and inter got ranocchia. Bochetti went to Rubin for about 11m. Has done pretty well there, they finished third place. Means they will be in next seasons CL playoffs, and they are going strong in the EL knockouts. The next big thing to come out of the Barca youth ranks, Rafa Alcántara ( Rafinha ) 17, Thiago's younger brother. He's a bit like Lamela. Last edited by acmilan4ever; 17-01-2011 at 14:59. 90% of the new talents of football are brasilians or agentines... Soon, all the national teams in the world, will only have players from Brazil and Argentina!